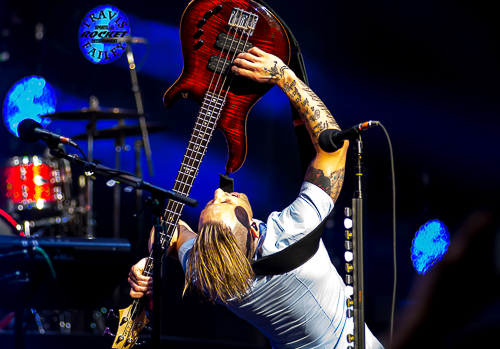 SHINEDOWN, NOTHING MORE Live In St. Petersburg, FL With Photos! 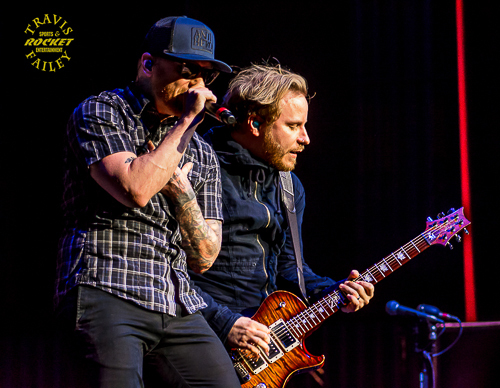 SHINEDOWN made its first stop on its 2015 U.S. Summer Tour at the Mahaffey Theater in downtown Saint Petersburg on Thursday, July 9, 2015, with guest NOTHING MORE. 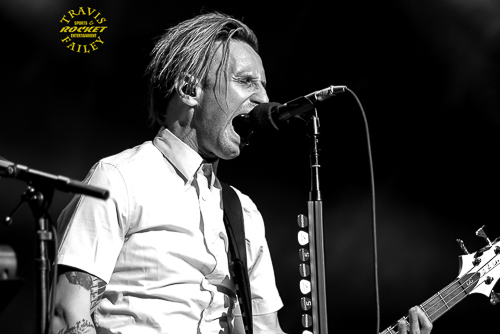 The Summer Tour is in anticipation of SHINEDOWN’s fifth release, which is due out next month. It’s been a couple of years since SHINEDOWN has been in town, and as anticipated, the show sold out almost immediately. After attending a series of outdoor music festivals in Florida this summer, it was nice to attend a show in an air conditioned venue where you could sit or stand in comfort, enjoy your drink, and have access to a flushing toilet. 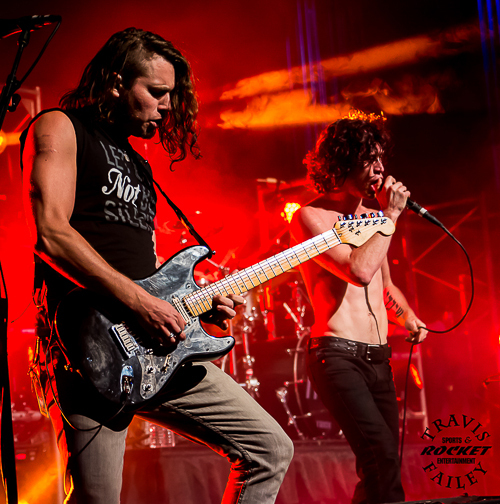 NOTHING MORE opened the show with their smash it, "Mr. MTV", then kept the energy going with “Christ Copyright” and “Matthew Effect”. Next up was some fun with the bassinator. The bassinator, created by NOTHING MORE’s bassist, Daniel Oliver, is a 5-foot-tall bass made from pipes and scrap metal. The bassinator is attached above a metal-reinforced, motorcycle chain-adorned drum kit. Jonny then stands on the snare, which allows the bassinator to be played by Jonny, Daniel and Mark at the same time. Another cool thing about NOTHING MORE is that everyone in the band plays the drums. In fact, Johnny was the drummer for NOTHING MORE prior to taking over the vocals. Speaking of vocals, Jonny showed his range with their latest hit, “Jenny” and their break-out hit, “Now Is The Time”. NOTHING MORE closed out its set with fan favorite, and drum beating extravaganza, “Salem”. Is it PC to have to the crowd scream in unison, “BURN THE WITCH!”? I don’t know. But it’s cool, and it just feels good for some reason. 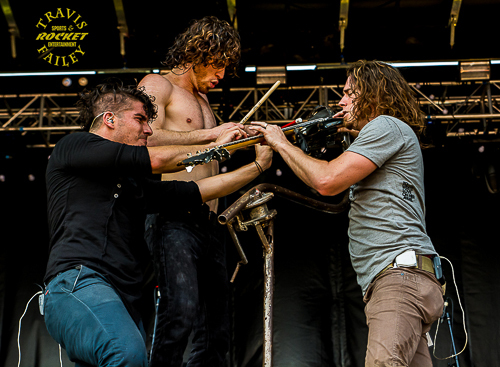 It was another great performance by NOTHING MORE. The energy, intelligent lyrics and overall performance from these gentlemen is second to none. Personally, I can’t wait to hear some new music from this band. With talent like this, there is no way that NOTHING MORE is a one album wonder. If you haven’t seen NOTHING MORE perform live, you need to. 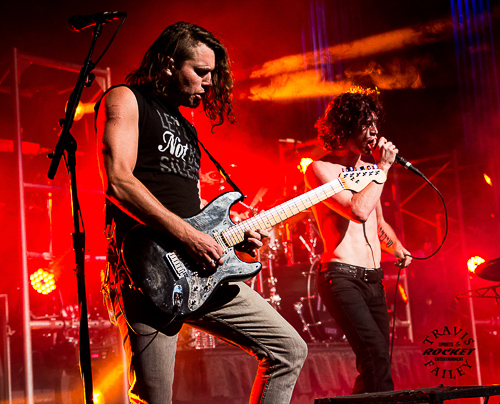 NOTHING MORE has had a lot of success gaining new fans by opening for many different bands as they have been on the road non-stop for years. 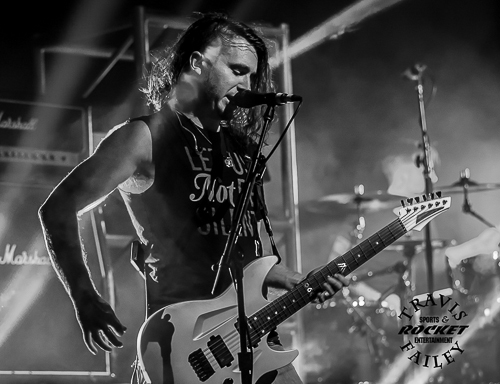 Opening for SHINEDOWN on the Summer Tour will only increase NOTHING MORE’s fan base by crossing over generations of fans with their own original style of hard rock. Next up was SHINEDOWN. SHINEDOWN has been rocking our airwaves since 2003 when they released their first album, Leave A Whisper. 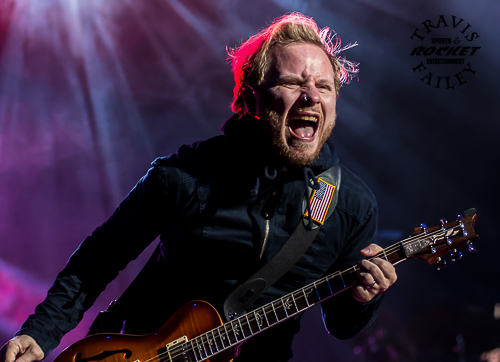 SHINEDOWN followed up with Us And Them (2005), Sound Of Madness (2008) and Amaryllis (2012). SHINEDOWN has been through some major band member changes since we first discovered them when they released the singles “Fly From The Inside” and “45”. Original members Brad Stewart and Jasin Todd left the band for various reasons and underrated guitarist Zach Myers and bassist Eric Bass replaced them. 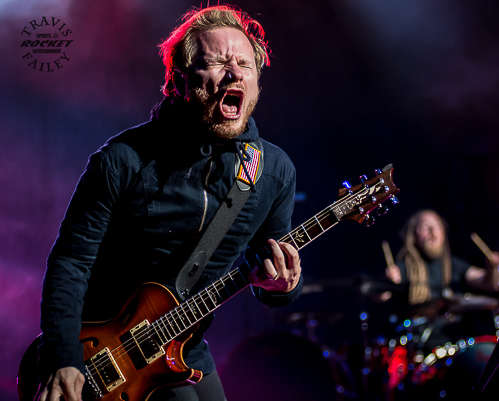 It’s been a long three years, but SHINEDOWN will release its fifth album late this August. The band came out on the stage in an unassuming fashion with the Mahaffey Theater’s house lights still on. SHINEDOWN’s vocalist Brent Smith, 37, typically sports a new look with each new album, and he didn’t disappoint Thursday night. Brent came out sporting a short hairdo, wearing a baseball cap, dark sunglasses, a flannel shirt and jeans. You know that moment when you go see a band that you have seen every touring cycle, you own all of their albums, and then they open up a show with a song that you’ve never heard before? Well, that happened. SHINEDOWN opened up with a new song, at least to me, “Asking For It”. Then came the songs that I know and love: “Crying Out”, “Fly From The Inside”, “If You Only Knew”, “Unity”, “The Crow & The Butterfly”, “Diamond Eyes (Boom-Lay-Boom-Lay-Boom)”, “I’ll Follow You” and “Enemies”. Nonstop musical bliss accompanied by a perfectly choreographed laser light show. No one was sitting down in the sold out Mahaffey Theater. 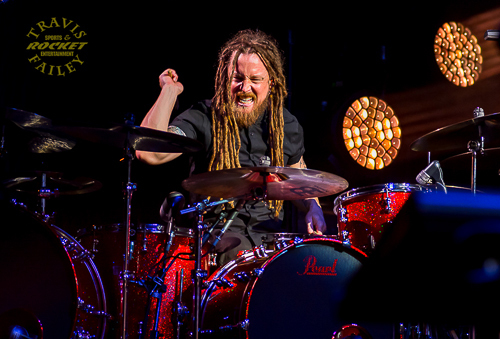 SHINEDOWN slowed it down and busted out the chairs and acoustic guitar and drummer Barry Kerch stepped down from the big kit as the crew rolled out a secondary drum kit. They played an acoustic set that included “I Dare You”, which vocalist Brent Smith stated they haven’t played live in seven years, as well as “In Memory” and “Through The Ghost”. After the acoustic set, SHINEDOWN amped it up with its latest release and anthem, “Cut The Cord”. Like “Enemies”, “Cut The Cord” has a powerful social message that will surely resonate with a lot of their listeners and become another huge hit for SHINEDOWN. The walk down SHINEDOWN’s musical memory lane continued with “Devour”, “45”, “Bully”, “Second Chance" and a powerful performance of LYNYRD SKYNYRD’s “Simple Man”. SHINEDOWN closed their set and ended the show with “Sound Of Madness”. After seeing SHINEDOWN many times during the last decade, I can easily say Thursday night’s performance was their best and it was the first show of this tour. SHINEDOWN is a cohesive unit and has been for a few years now, and tonight the band played 19 songs with absolute precision and synchronicity. 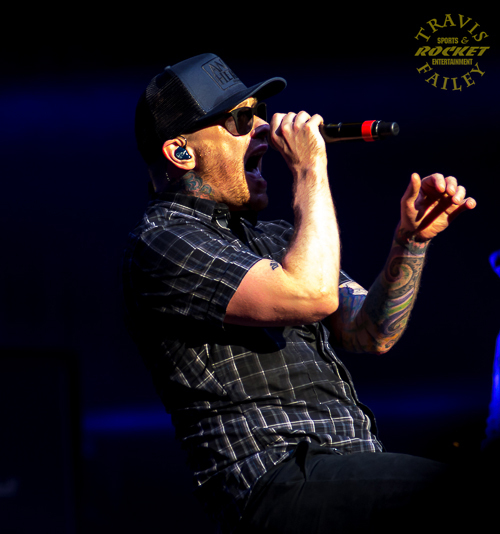 Frontman Brent Smith’s performance proved once again that he belongs in the discussion of the top vocalists in the industry, and drummer Barry Kerch played his drums with bad intentions. The vocal harmonies are now in perfect tune but there was some back tracking during the set but that’s pretty much a given these days. The crowd participation was fantastic and most were familiar with the lyrics especially during “Simple Man”. 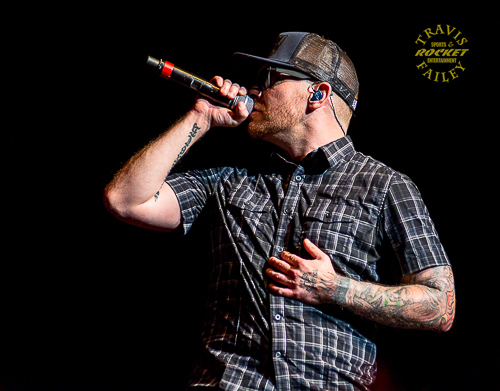 As SHINEDOWN left the stage, Brent Smith said to the crowd “It’s up to you who stays and who goes,” and evaluating the crowd’s reaction throughout the night at the Mahaffey Theater in St. Petersburg, SHINEDOWN will be staying around for many years to come. Being familiar with NOTHING MORE and SHINEDOWN, I wasn’t sure how this musical combination would translate to the crowd. I figured that a majority of the fans in attendance at the show would be SHINEDOWN fans as SHINEDOWN is a well-established rock band with an extensive musical catalogue, and NOTHING MORE, in the grand scheme of things, is somewhat new to scene. 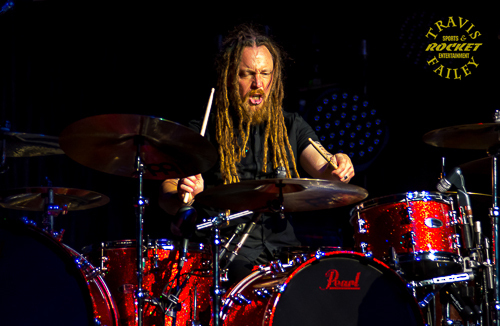 SHINEDOWN plays a powerful, ballad, anthem musical style, and NOTHING MORE plays with an energetic, quick, drumbeating style. But the two bands successfully complimented each other. The old school NOTHING MORE fans got to see another great performance by the band and those in attendance only familiar with the music they’ve heard on satellite or the radio who’ve never seen NOTHING MORE perform live got to see and hear the musical gymnastics that will hopefully inspire them to dig deeper into NOTHING MORE’s musical catalogue. Speaking of NOTHING MORE’s musical catalog, I would humbly suggest that NOTHING MORE think about playing some other tracks that would complement SHINEDOWN’s catalog like “I’ll Be Ok” and “If I Were”. 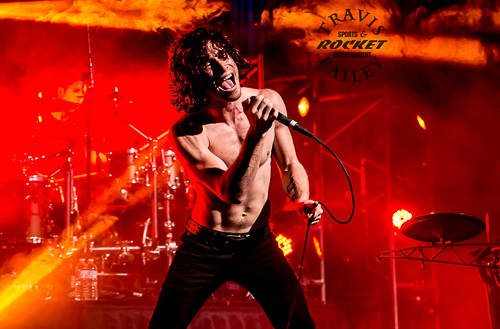 I am confident that NOTHING MORE, an incredible live show band, will continue to attract new fans throughout this Summer Tour. SHINEDOWN is a musical powerhouse and I can’t wait to hear their new album next month.